Things haven’t been looking so good for bitcoin and its buddies these days, but could these nearby support levels still cause a bounce? Or will this super rare stegosaurus pattern finally play out? Bitcoin is still in selloff mode as it cruises inside a descending channel on its 1-hour time frame. Price might even be poised for a steeper slide as the mid-channel area of interest is already keeping gains in check. With that, bitcoin could aim for the next downside targets marked by the Fib extension tool. 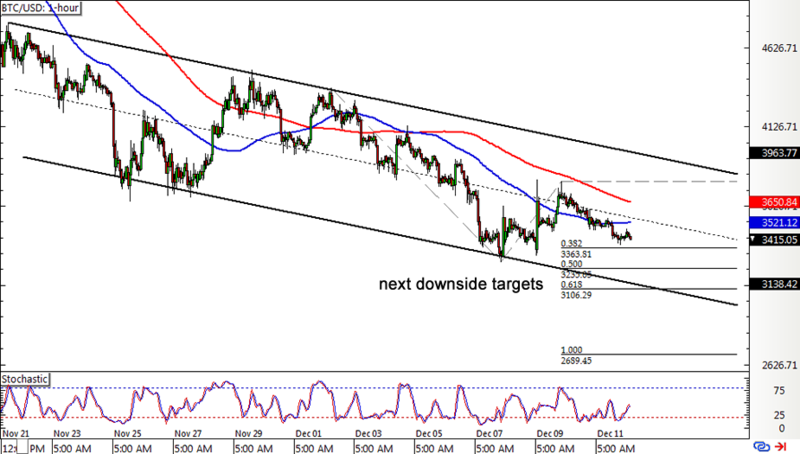 the 50% level is close to the swing low while the 61.8% level lines up with the channel support at $3,100. The full extension is all the way down at $2,659.45. The 100 SMA is below the longer-term 200 SMA to suggest that the downtrend could carry on, but the gap between the two has narrowed enough to hint that a new crossover may be possible. Also, stochastic is turning higher, so bulls might still be able to take over. Ethereum broke below that triangle consolidation pattern we were eyeing last week, indicating that further losses are in the cards. But hold up! 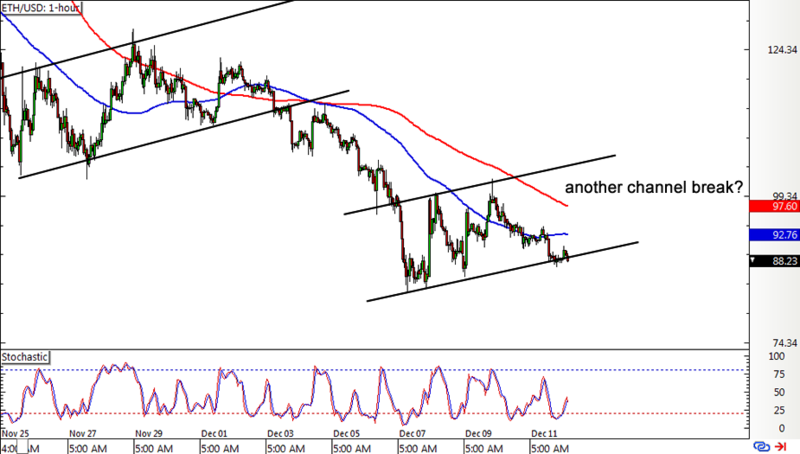 Price is forming higher lows and higher highs, creating an ascending channel and possibly signaling an uptrend. 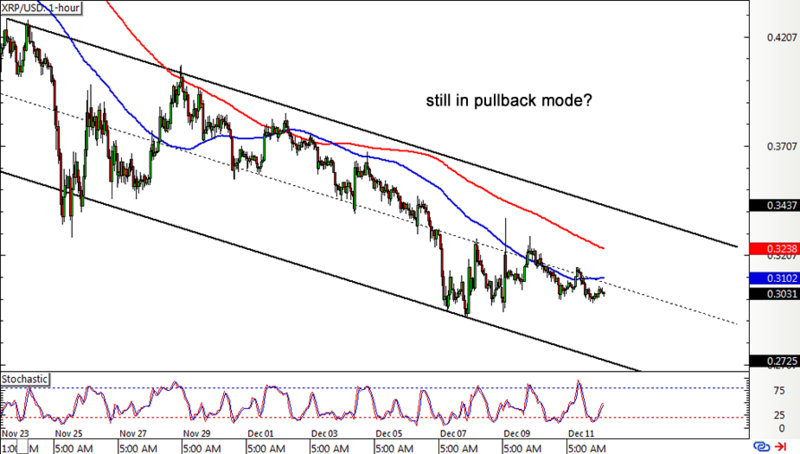 Stochastic is also pulling up from the oversold region to suggest that buyers might have the upper hand. Then again, scrolling back to the earlier channel pattern reveals that this is usually followed by a break lower and a corresponding slide, and the moving averages seem to suggest a repeat performance. Litecoin might also be setting its sights lower after recently bouncing off the 100 SMA dynamic resistance at the mid-channel area of interest on its 1-hour chart. The 38.2% level lines up with the swing low and might be where some bulls are waiting to buy on dips while the 61.8% level seems closer to the channel bottom just below the $20 level. The 100 SMA is below the 200 SMA to confirm that the path of least resistance is to the downside, but stochastic is pulling out of the oversold region to suggest that a return in bullish pressure is in order. XRP is in a channel of its own and still seems to be in correction mode. 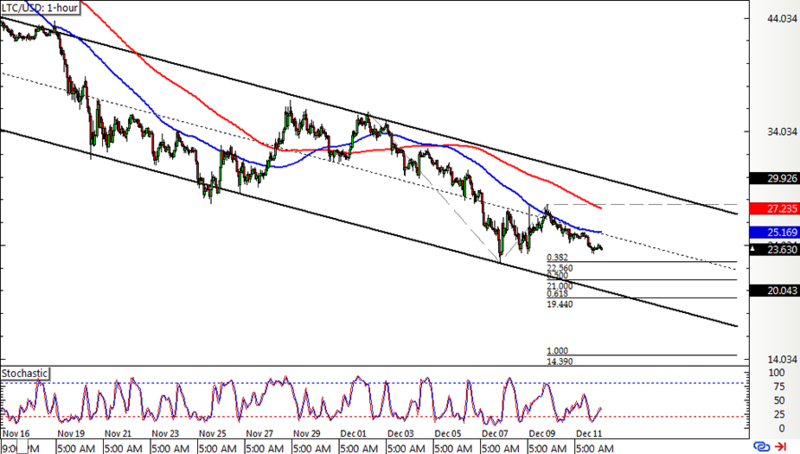 Price is just testing the middle of the descending channel after all and might have a shot at pulling up to the top. So far, the 100 SMA is holding as dynamic resistance while the 200 SMA is just close by and might be a barrier as well. Stochastic is climbing out of the oversold region to signal that buyers are taking over, and the oscillator has a lot of room to climb before reflecting bullish exhaustion.